About twelve inches long. Purplish blue above with a conspicuous crest. Black forehead and some black around the neck joining some black on the back. Wings and tail bright blue barred with black. Grayer underneath and lighter on the throat & tail coverts. Inhabits coniferous and mixed forests throughout most of North America from the eastern slopes of the Rocky Mountains to the Atlantic Coast from the Gulf states to Newfoundland. Move but do not migrate. Intelligent, inquisitive and mischievous. Exhibits forethought and reasoning. Amuses, tricks, wrecks, robs and hides. Eats various fruits and larger insects, bark and wood borers, grasshoppers and caterpillars and occasionally a mouse, small fish or snail. It buries hoards of grain, nuts and acorns, or hides them in knot holes and behind loose bark many of which are forgotten and left to the mice and squirrels or to replant the forest. The warning call of alarm that gives it its name alerts the whole forest, sometimes arousing flocks to harass owls. Has another common note that sounds like a barn door squeak. Is quite talented at imitating other birds like the red-shouldered and red-tail hawks, and other odd noises, even machinery. A bully at feeders. 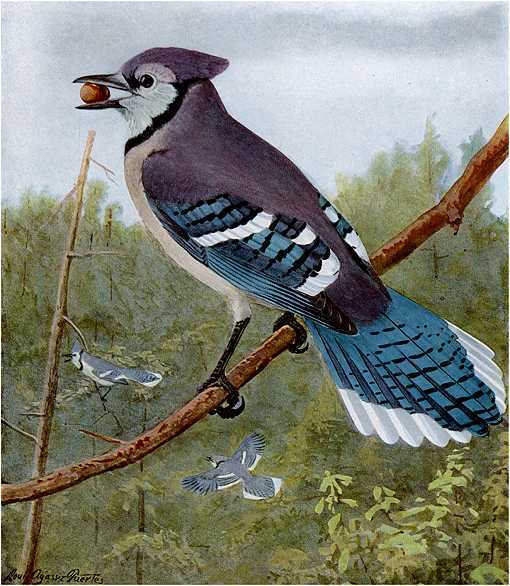 Jays regularly strike dogs and cats and sometimes take a swipe at the top of someone’s head as they walk by. 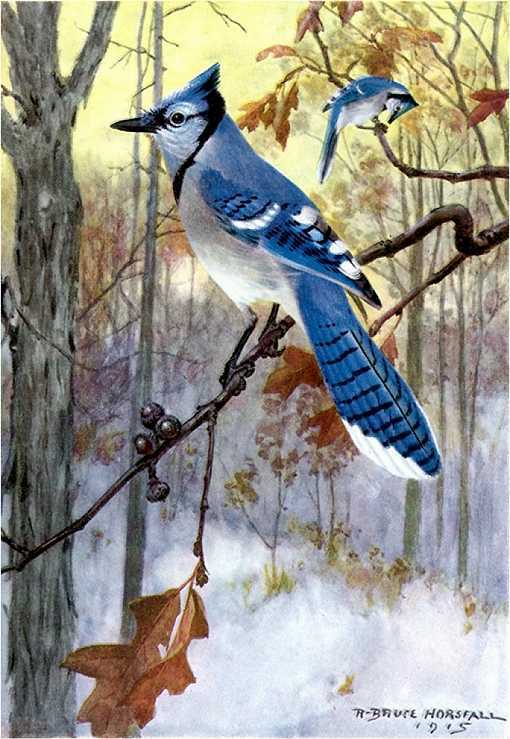 Bluejays build nests of twigs, leaves, roots and odd rubbish usually in pine trees up to twenty feet high deep in forests, in groves and they have a special liking for wooded towns and even major cities where they are quite accustomed to people. The female lays three to six pale olive speckled eggs which hatch after about two weeks incubation and young leave the nest in about another three weeks. On rare occasions blue jays have nested on ledges formed by building molding, cornices, headers, etc. and on robin platforms. Platforms will more likely attract robins than blue jays, however, either bird family will be fun to watch. 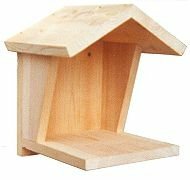 The Mourning Dove Platform has extra room under a gable roof for the larger back yard platform nesters: mourning doves, robins and blue jays. It has an 8″ by 8″ base, is about 8″ floor to ceiling and has an open front and partially open sides. Assemble with corrosion resistant screws fit to pre-drilled countersunk pilot holes to reduce splitting wood. Install a platform on the side of a garage, shed or porch under open shelter or an eave over looking both open spaces and foliage in your back yard from seven to twelve feet high. Never install in a tree or near objects that cats and squirrels can climb. Squirrels can leap 8′ horizontally! Platform nesting birds claim platforms that best simulate ledges on cliff faces which are difficult for predators to scale. They can also scan the surrounding area and below. 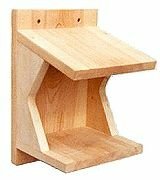 The Robin Nesting Platform has an 8″ by 8″ base, measures approximately 8″ floor to ceiling, has an open front and partially open sides. If the location is under a roof, porch or eave, consider installing this Open Platform. Robins, mourning doves and phoebes also may use these platforms.